Packaging is very nice. The use of recycled cardboard and other more ethical materials is a nice touch given some of the more obscene and non environmentally friendly packing used by the likes of Beats by Dre etc. The headphones themselves are presented nicely and are well protected. Accessories are reasonable. They include a very nice denim pouch with the House of Marley branding on it, it is of far better quality than the soft cases included by many other companies. To be fair though there isn't much you can add in the way of accessories to headphones so its really only a case and some manuals with the liberates. A hard case would have been much preferred however just to add that little bit more protection on the go. Ok I'll admit that personally I'm not too big a fan of the denim in the Liberate model, its just a touch too 80's throwback for me. However I did manage to go into a local high street store and see that these were also offered in a saddle variant and they are much nicer adding a touch of class. 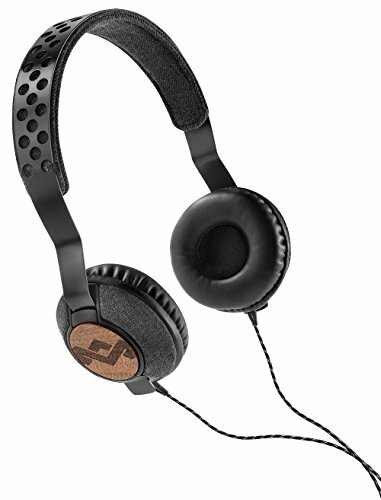 The headphones have some very cool styling cues with an aluminium headband, wood inserts on the cups and a very nice cord cable. The plastic used on the headphones does feel slightly cheap but the pads were very nice. In regards to build quality they are very well built and should last through some rough treatment. Very comfortable on the head, comfy pads and a good amount of pressure from the headband make it a well fitting headphone that can be used for long periods whether traveling or sitting at a desk. Is also very light which again bodes well for wearing whilst out and about. Sound is very nice, in fact it is right up there with the best on ear portables under the £150 mark. It performed well across all spectrums and has a consumer friendly sound signature with slightly elevated bass. Highs – A little laid back and very inoffensive they sound good but do lack in detail. To be honest this goes well with the type of music a House of Marley fan would listen too. Mids – Mids are very good. Smooth and reasonably detailed vocals come across clear and intimate. They sound very well balanced with the rest of the spectrum and do so while coming across with a very natural presentation. Lows – Bass is emphasised here but not to the level of bass cannon status. This is a good thing and sets the House of Marley Review apart from other high street competition that like to throw masses of unrefined bass around like it was going out of fashion (quite ironic that it is going out of fashion). The Liberates manage to go down low whilst still sounding detailed and articulate. Couple this with a good speed of attack on the bass they are excellent for genres such as Hip Hop, Electronic, Pop and Rock. We started out this House of Marley review a little skeptical as we do with anything designed toward the fashion crowd and not directly at audio enthusiasts but the Liberates proved themselves to be style with substance. In the saddle colour scheme they are a very very good looking set of headphones and they offer great sound too. With a retail price of £99 they offer excellent value for money and I cant think of a better headphone on the UK high street with better sound, build and style than these under that magical £100 price point. More information regarding the entire range of House of Marley Headphones at the link.